This fast-and-easy Croatian shrimp recipe or škampi na buzara, which literally translates to "shrimp stew," can be on the table in about 45 minutes. Buzara-style cooking simply means that some type of shellfish or crustacean is cooked with olive oil, wine, garlic, breadcrumbs, and fresh herbs. Dagnje na Buzaru or stewed mussels is another example of this style of cooking. Skampi na buzara can be prepared with head-on shrimp, tail-on shrimp, or peeled shrimp. But, as you can imagine, leaving the shells on when stewing makes for a delicious sauce just perfect for dipping in crusty bread. Devein, rinse, and pat dry the head-on or tail-on shrimp and set aside. Add oil to a large skillet that has a lid and fry the breadcrumbs until they just start to toast. Add garlic, parsley, tomatoes, and Vegeta seasoning. Bring to a boil, reduce heat and simmer uncovered for 10 minutes. Add wine, salt, and pepper and bring to a boil. Add shrimp, reduce the heat, and cover. 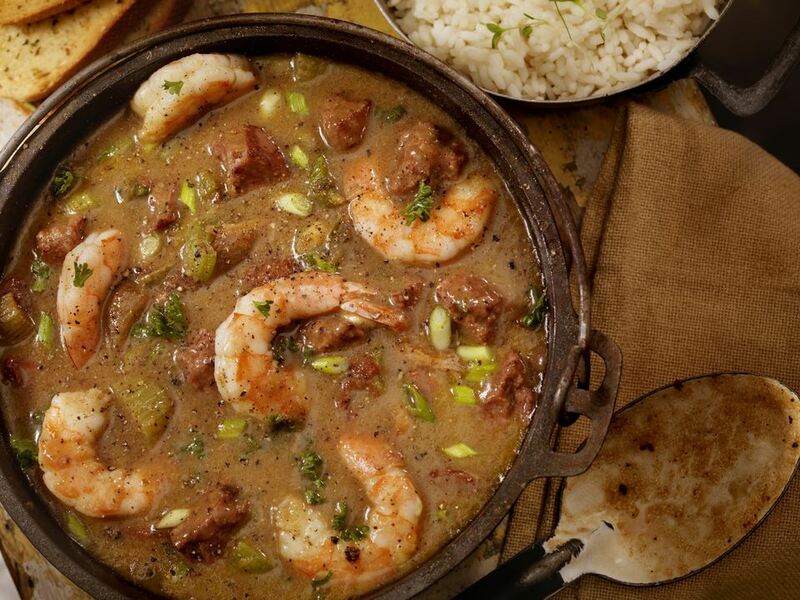 Simmer 15 to 20 minutes or until shrimp are cooked and juices have thickened. Don't overcook or the shrimp will become rubbery. Remove the shrimp from the skillet with tongs and place in a large bowl. Pour the cooking juices into a gravy boat or other container. Let your guests serve themselves. The shrimp are peeled at the table and eaten with polenta, cornbread, or crusty bread that they dip into the flavorful sauce. Note: If you are avoiding salt and MSG, try a homemade version of store-bought Vegeta. This shrimp recipe is just one of the examples of the rich seafood offerings along the Dalmatian coast that is influenced by neighboring Italy. Meals often begin with some type of pasta or risotto, and then it's on to fresh fish and seafood. Fish is usually grilled with local olive oil, garlic, and lemon, and seafood often finds its way into soups and stews as in this recipe.